Tips and resources for forest-to-table family fun! This spring break will mark our family’s third annual clamming weekend. 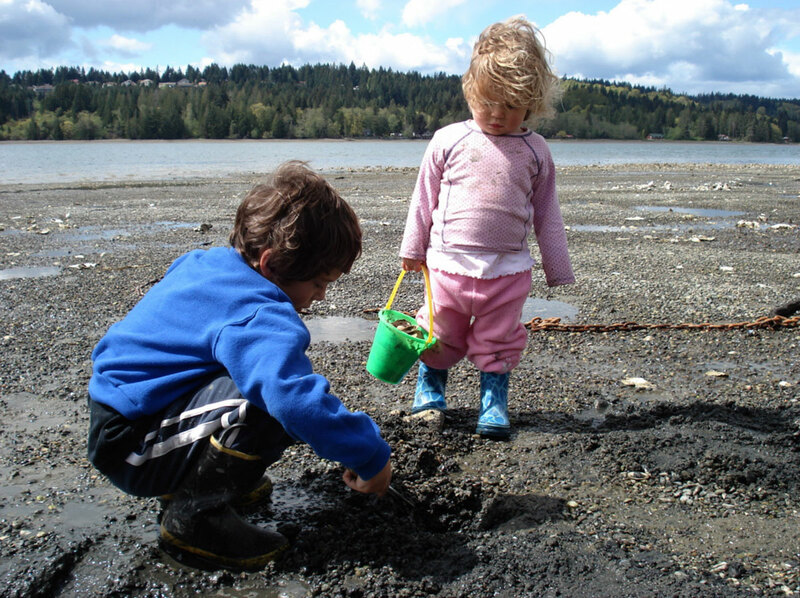 As the winter rains pour down, I picture driving across the Hood Canal Bridge as my daughters spy our favorite beach for digging Manila clams. I can smell the wet sea-salt air and feel the water collecting on my face. I can see my oldest digging next to my husband while my youngest walks atop the logs that line the sand. It won’t matter if the sun shows its face as we collect our dinner fare near the bay’s water. Rain or shine, my family is nourished by nature during this yearly foraging expedition. Although many people have discovered foraging as adults, kids take to it naturally, from muddy adventures such as clamming and spring fiddlehead hunting to summer berry picking on mountain trails. “Once you get them outside, kids are not distracted by cell phones or work issues like adults are. It’s amazing to see the transformation. They are just open to everything around them: the sights, the sounds, the smells,” says Langdon Cook, Seattle-based foraging expert and author of The Mushroom Hunters and Fat of the Land. Hunting for edibles is as old as humankind, of course. But foraging as a family hobby is a more recent phenomenon, with a growing roster of Seattle-area classes, books and websites fueling new interest in this age-old practice. As experts like Melany Vorass Herrera, author of The Front Yard Forager, teach, you don’t even have to leave the city to harvest edible urban weeds, such as dandelion greens. And although some cities, such as Seattle, ban foraging in their parks, spots like the Beacon Food Forest, a new edible urban forest in Seattle’s Jefferson Park, might be the model of the future. The food forest was designed and built to mimic the natural forest while substituting plants that the community needs, from wild berries to edible greens. “Perhaps foraging is part of the movement to get kids outdoors. People are also looking backward to simpler times, with foraging being part of a rebirth of home arts: sewing, canning and creating backyard gardens. I also see it as part of the pushback to all things media. When a parent notices his 2-year-old is adept at navigating an iPhone, his natural response is to get everyone off of the devices and out into nature,” says Cook. Becoming an ethical forager also teaches kids important concepts around sustainable harvest and a “leave no trace” mind-set. “Ethical harvesting means you have respect: You only take what you need, and you leave some for the people behind you,” says Glenn Herlihy, cofounder of the Beacon Food Forest. 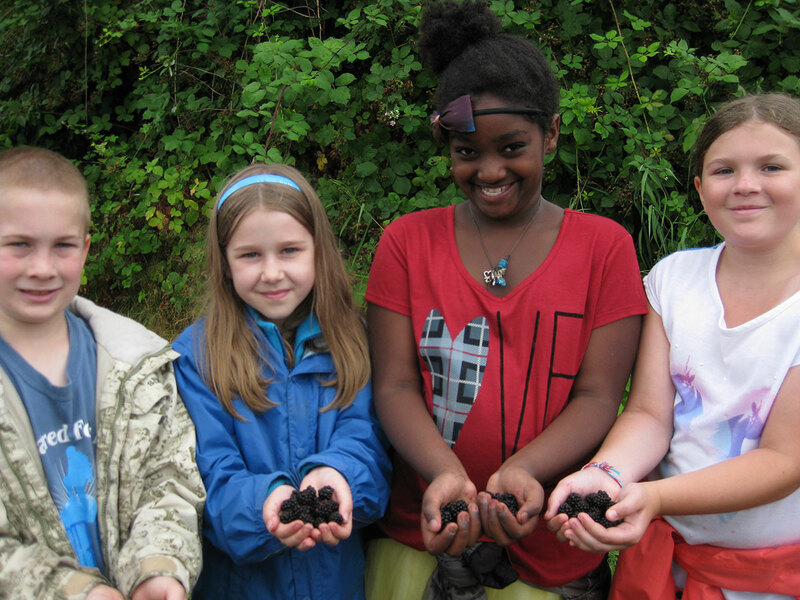 Families in the Seattle area can get started foraging in several ways. You can sign up for a local class and buy a guidebook or two that will help you start to learn to identify edible plants — a critical part of foraging safely. “The forager’s golden rule is to never, ever eat anything from the wild without 100 percent certainty of its identification,” says Cook. If you live in the greater Seattle area, the Beacon Food Forest is a convenient place to start foraging. Anyone can pick edibles in the west side of the forest — the section open for community harvest — and they can return to help maintain the space at a monthly work party (held the third Saturday of every month from 10 a.m. to 2 p.m.). During late spring and into the summer months, you can search for strawberries, mint, perennial herbs, spinach, kale, a variety of lettuces, beans and peas, sweetgrass, lemongrass, and possibly goumi berries and currants. Here are more picks for foraging the bounty that’s available this spring and summer in the Puget Sound area. 1. Wild greens: You can send kids on a hunt for wild greens, possibly starting in your backyard. 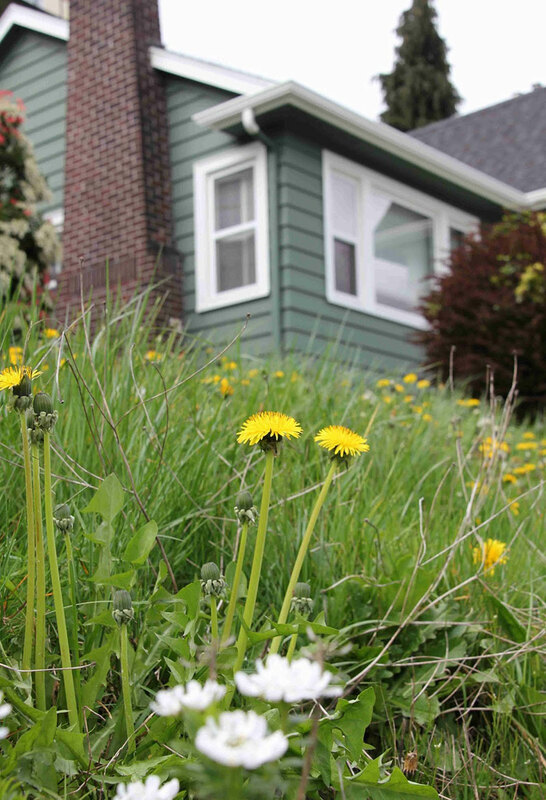 Urban foragers can pick shotweed, chickweed, catsear greens, dandelion greens, roots and flowers from lawns, gardens and untended lots during a Northwest spring. Herrera’s Front Yard Forager gives detailed descriptions of many more edible weeds that are plentiful on undisturbed soil in the spring. 2. Fiddlehead ferns: Fiddleheads are the tightly curled frond of wild ferns that emerge in the early spring. In western Washington, the only variety of edible fiddleheads is the lady fern, which is abundant in damp spots near streams and creeks in low-elevation mixed woods. “The best way to learn to forage is to look for a patch of these in the summer when they are up and easy to identity, then you go back in the same place in spring. Then the young growth of the fern (the frond) will be tightly coiled instead of unfurled,” says Cook. 3. Mushrooms: In western Washington, oyster mushrooms can be found in the same wooded habitats as fiddleheads, growing on dead or dying alders, says Cook. On the east side of the Cascade Range, you will more often see oyster mushrooms on dead or dying cottonwood trees. Drive over the pass to hunt for morels and spring porcini, too. 4. Wild berries: Wild-berry picking might be the most accessible foraging activity for families (who hasn’t stopped to snag ripe blackberries in August?). Langdon Cook says that it’s also more accepted to pick berries — particularly invasive Himalayan blackberries — in city parks where other kinds of foraging are not allowed. Cook’s picks for wild berries include red huckleberries, usually ripe by early July in the low-elevation mixed forests of western Washington; salmonberries, “often finished before the summer solstice at lower elevations”; and native blackberries, also known as the trailing blackberry, which are “usually ripe around the same time as the red huckleberry.” In August or September, you can find mountain huckleberries on hiking trails. Langdon Cook offers foraging classes throughout the year, ranging from Seward Park Wild Edibles Walks on March 6 and March 13 to a razor clam weekend from May 20–22. Pacific Science Center offers two summer day camps at Mercer Slough Environmental Education Center — Slough Survival (for second- through fourth-graders) and Wild Survivor (for fourth- through sixth-graders) — that include lessons on wild edibles and traditional uses of native plants. 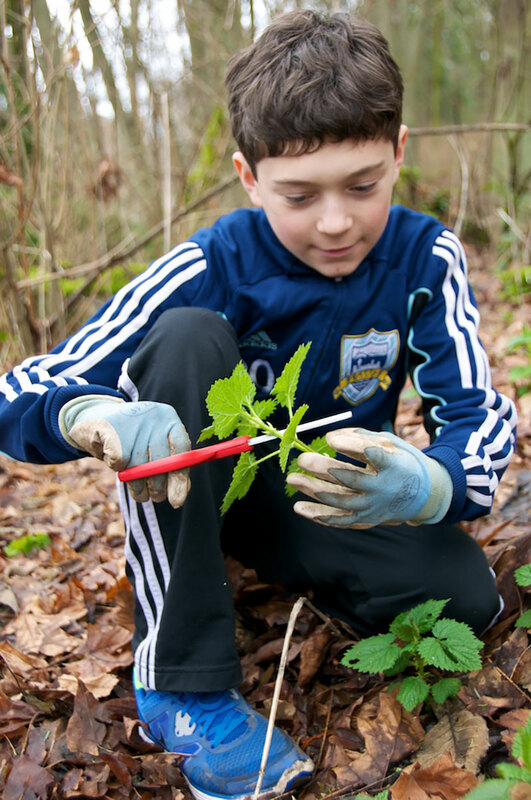 Seattle Tilth’s “Survive and Thrive with Wild Plants” is a weeklong summer day camp for ages 11–15 (from Aug. 10–14); it also organizes classes for adults on harvesting urban weeds and wild foods. Wilderness Awareness School’s day camps and overnight camps all include lessons in foraging and opportunities to harvest wild edibles (except at the Seattle locale). Langdon Cook’s The Mushroom Hunters and Fat of the Land. Melany Vorass Herrera’s The Front Yard Forager: Identifying, Collecting, and Cooking the 30 Most Common Urban Weeds. Herrera recommends these websites for information on edible weeds: Plants for a Future; USDA; Eat the Weeds. The Washington Department of Fish & Wildlife’s (WDFW) website has excellent information for seafood foragers. Cook recommends books including Plants of the Pacific Northwest Coast; Edible Wild Plants; All That the Rain Promises and More; and Mushrooms of the Pacific Northwest. Mushroom hunters should also consider joining a mycological society, such as the Puget Sound Mycological Society.